Tite Kubo, the son of a town council member in Fuchu, Aki District, Hiroshima. He never took drawing seriously until he was 17; after reading Dragon Ball he knew he wanted to be a manga artist. At the age of 18 he submitted his first concept for the series Zombiepowder but it got rejected. Zombiepowder was rejected multiple times until Kubo was 22, when it finally was accepted by Shonen Jump. It did not last long; it was cancelled after four volumes in late 2000. His next series, Bleach, about a high school student who becomes a shinigami and fights hollows, was not such a failure. Bleach began regular publication in 2001. It has been running in Weekly Shonen Jump ever since. 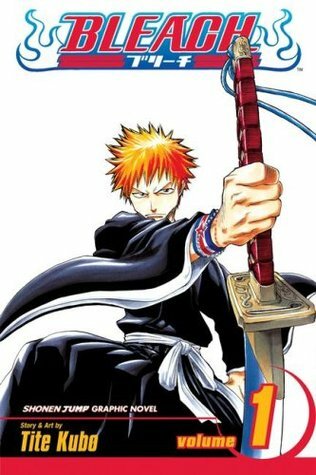 Hot-tempered 15-year-old Ichigo Kurosaki, the hero of the popular fantasy-adventure Bleach , has the unsettling ability to see spirits who are unable to rest in peace. His sixth sense leads him to Rukia, a Soul Reaper who destroys Hollows (soul-devouring monsters) and ensures the deceased find repose with the Soul Society. When she’s injured in battle, Rukia transfers her sword and much of her power to Ichigo, whose spiritual energy makes him a formidable substitute Soul Reaper. But the orange-haired teenager isn’t sure he wants the job: too many risks and moral dilemmas. ~Sliding Scale of Plot VS Character: The series Bleach is very Action orientated (lots of fight scenes) but the story itself is more Character orientated, when Tite Kubo focuses on specific characters, he does a great job, but the plot is slow. In fact, with Bleach, there are a lot of subtle hints and clues that a first-time reader might not necessarily pick up. There’s also a lot of back-story and character history that is only hinted at within the first three volumes, but it does get explained and does make sense. ~I Found This Humerus: While there are lots of good fight scenes (if that’s what you’re into), it’s the wide range of humour that I enjoy the most about this series. As the series progresses, it does get Darker and Edgier, so the humour balances things out. ~Long Term Commitment: While I think highly of the Bleach Manga series, I did stop reading the series half-way through The Lost Agent Arc. This is for multiple reasons, the primary reason being Arc Fatigue and the fact that the reader in dumped right into the middle of a time-skip and I was introduced to a whole bunch of new characters (via an organization called “Xcution”) that I cared very little for (mind you, this is at least 50 volumes into a 74 Volume series). I’m going to attempt to read it from the beginning. All in all, it’s a good action urban fantasy with a super intricate plot, and I am happy to recommend. Previous Stim Toy Review: Artist’s Collection Knock Off Tangle Jr.